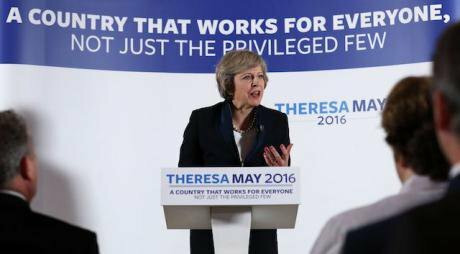 Home Secretary Theresa May officially launches her campaign to become prime minister at Austin Court in Birmingham. Chris Radburn/Press Association. All rights reserved. These are not my words. George Orwell wrote them in his famous 1946 essay ‘Politics and the English Language’. Orwell thought that language was being used in a slovenly way because it was used to express ill-thought out ideas. And, ill-thought out ideas are a result of the tolerance of slovenly language. There is a vicious cycle: slovenly language produces slovenly thought and slovenly thought uses slovenly language. When the correct use of language ceases to matter, then thought ceases to matter. Whatever else is true about Brexit, it has produced a large volume of slovenly language. Here are a few examples. ‘Take back control’, ‘global Britain’, ‘deep and special partnership’, ‘re-engaging this country with its global identity, and all the energy that can flow from that’, or ‘the people of our country voted to leave because they believe in Britain’, ‘delivering an innovative, competitive and growing UK economy that benefits individuals and communities and makes sure the value of trade is more widely shared’, and, of course, ‘Brexit means Brexit’. All these examples have the same qualities. Though they sound serious, they are really meaningless. The Prime Minister has just repeated that voting down her deal risks there being no Brexit at all. Does she recognise that, far from being a risk, recent polls show that, actually, a vast majority of people would like no Brexit at all in order to save jobs, protect the environment and ensure our standing in the world? Will she acknowledge that the will of the people can change and that the will of the people has changed? Does she therefore think that the way forward is a people’s vote, or does she think democracy ended on 23 June 2016? The hon. Lady’s claim in relation to democracy is absolutely ridiculous. This Parliament gave people the right to choose whether to remain in the European Union or to leave the European Union. People exercised that vote, and we saw numbers of people voting that we had not seen before. It was a great exercise in democracy in this country, and I believe it gave this Parliament an instruction. We should ensure that we leave the European Union, as the people voted. I offer this example because both Caroline Lucas and Theresa May, though they come from very different parts of the political spectrum, are serious and intelligent people. If they can both talk in meaningless slogans, what hope is there for anyone else? Take Theresa May’s claim that in offering a referendum, Parliament created a situation in which the people could give Parliament an instruction. Parliament did no such thing. The relevant words in the referendum legislation were the opening ones which simply said ‘A referendum is to be held on whether the United Kingdom should remain a member of the European Union.’ The rest of the Act concerns the mechanics of the process. There is nothing about the constitutional status of the referendum, whether it was to be advisory or mandatory, what ‘membership’ means or what the implications of a vote either way would be. Would continued membership of the single market be consistent with a vote to leave? Would continued membership of the customs union be consistent? And so on. An instruction must be something that you can act upon. If I am instructed to climb up and down the stairs three times, I know what I have to do to follow the instruction. I may choose to ignore the instruction, of course, but ignoring a clear instruction is not the same as having no intelligible instruction at all. Yet, the ambiguity surrounding what it means to cease to be a member of the European Union amounts to there being no instruction at all. It is like being told to climb higher, without being told whether you are to go up the stairs, up the ladder or simply up the wall. So when Theresa May says that the referendum gave Parliament an instruction, how does she derive this conclusion? She is relying on a simple syllogism that runs something as follows. The referendum gives us the will of the people; the government is acting in accordance with the will of the people; therefore Parliament should accept what the government has negotiated. But can ‘a people’ have ‘a will’? What could it possibly mean for a large and diverse set of people, the citizens of a country at a particular time and in a particular place, to share one will? One obvious reply is that a group of people, no matter how large and diverse, can have one will provided that they all agree with one another. But no one pretends that this is true of Brexit. The campaign was raucous, the result divided and the aftermath rancorous. Different people had different views before the referendum, including different views on whether a referendum should be held. They voted in accordance with those different views. And many continue to think that the result was a mistake. There is no singular will of the people emerging from a plurality of people. There is no singular will of the people emerging from a plurality of people.You can defend referendum voting as a way of taking important decisions for a variety of reasons. You can say that it engages as many citizens as possible in making a choice that will be fundamental to their lives. You can say that the only way of reconciling people to a controversial choice is to enable them to vote in a referendum. You can say that a referendum treats everyone according to a principle of political equality, which is a foundation principle in a democracy. Sometimes these claims will be true and sometimes they will be false. What you can never say, however, is that a referendum uncovers the will of the people. The will of the people is not a real thing out there in the world like the chemical composition of hydrochloric acid or the number of legs on a spider. 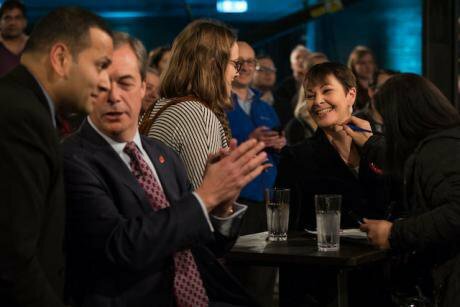 Nigel Farage and Green Party MP Caroline Lucas at the Channel 4 Brexit debate Live at the Custard factory, Birmingham, November 5, 2018. Aaron Chown/Press Association. All rights reserved.A referendum is a vote conducted according to certain rules. Change the rules and the result may well be different. Have a super-majority rule instead of a simple majority rule, and you will come to a different view about the will of the people and whether people want change. Require a certain minimum turn-out and you can turn a majority of those voting into a minority of those eligible to vote. Make the referendum question a three-way, rather than a two-way, choice and you are likely to end up with no majority at all. There is no simple will of the people because different ways of counting the same opinions will give you different results, and there is no obviously one right way of conducting the count. Caroline Lucas was right to say that democracy does not end on a particular date. But it does not make sense to say that this is because the will of the people has changed. There seems to have been a shift of public attitudes towards Brexit, with a shift of opinion back towards remain. This means that the opinion of a set of individuals has changed. Maybe there have been lots of cross-cutting shifts of opinion, with some people turning towards leave and some people coming to favour remain. Individual people, perhaps through conversations with their friends and relatives, have changed their minds. There is no one super-individual – the people – that has changed its mind. There is no one super-individual – the people – that has changed its mind. One reason it is important to recognise that behind the imaginary one there is a genuine many is that it alerts you to the need to reconcile those who lost the vote to the result. One of the reasons why Brexit has been so acrimonious is that the referendum result was taken as a reason to suppress dissent. Even to raise the question of whether the decision was the right one was taken as a symptom of elitism, the committing of a thought-crime against the supposed will of the people. But there was no will of the people. There was a vote in which one side carried the day by a narrow majority. Given the lack of definition about what that vote meant in constitutional terms, it would have made sense for the government to reach out across party and partisan lines to explore realistically what the alternatives then were. Instead the myth of the will of the people was used in an attempt to justify executive action unconstrained by parliament. Only when the courts struck that attempt down was some semblance of constitutional process produced. There is a good case for holding a second referendum, but if one is held, it will not reveal something we can call the will of the people. It will yield a result according to the options put and the voting rules used. If the choice is put as a three-way choice – remain, leave on agreed terms or no-deal – there is unlikely to be a majority for any one of them. In those circumstances, a new counting rule will have to be used. Some favour the alternative vote, with the least favoured alternative being dropped before going on to determine a majority among the remaining two alternatives. Others (I am in this camp) think that you should use a rule that finds an alternative – if there is one – that beats each of the others in a series of pair-wise contests. But the fact that the counting rules in such situations need to be discussed and decided underlines the point that there is no will of the people independently of the rules used to combine different opinions. There is no will of the people independently of the rules used to combine different opinions. Unlike Orwell, I do not think that the use of slovenly language is a sign of a decadent civilization. But it is a sign of a civilization in which there is too much muddle-headedness. And muddle-headedness is a brake on sensible democratic conversation. How intoxicating it seems to be on the side of the sweep of history and the will of the people. How intoxicating, but how much the enemy of the hard, practical decisions that the members of any democratic society need to make.